The Manitoba Chamber Orchestra is “Canada’s tiny, perfect chamber orchestra” (Toronto Star). We say it often in our communications, and from time to time we can’t resist shining a spotlight directly on the esteemed musicians who work closely with the MCO. In this tour de force concert we do just that, with blistering solos from “master soloist” (London’s Sunday Times) and MCO concertmaster Karl Stobbe, and from Rachel Kristenson, who often sits second principal violin with the MCO. It will be an intimate affair in the marvellous setting of Westminster United Church. Much could be said about the quirky form of Haydn’s 45th Symphony. But perhaps the quirkiest thing of all is what inspired its composition. Haydn and his gang of musicians had been cooped up for much longer than expected in Prince Esterhazy’s summer home, and were dying to go home and see their families. Rather than appeal directly to the Prince for sabbatical, Haydn implanted the request in the music itself. During the final movement, each musician puts down their instrument, blows out the candle on their music stand, and leaves the stage in turn. The Prince took the hint, as the next morning the musicians woke up to discover carriages waiting to deliver them home. Our March concert also includes Mozart’s beloved 29th symphony and the premiere of two new works commissioned through our New Concerto Project. One is a double violin concerto by the brilliant JUNO Award winner Vivian Fung, whose music is celebrated for integrating non-Western folk music, Tibetan chant, and Brazilian rhythms. The other is a work by Kevin Lau, a prolific composer of orchestral, chamber, ballet, and film music, who studied with composer Christos Hatzis, another long-time MCO collaborator. 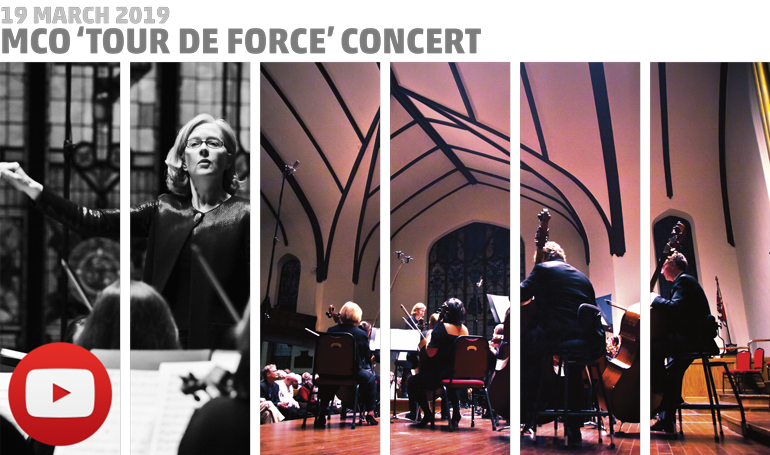 A superb concert that will inspire pride in some of Canada’s top musicians and composers. Karl Stobbe is one of Canada’s most accomplished violinists, and the MCO’s Concertmaster. Noted for his generous, rich sound, and long, poignant phrasing, he is described by London’s Sunday Times as “a master soloist, recalling the golden age of violin playing — producing a breathtaking range of tone colours.” Karl has performed in many of North America’s most famous concert venues, including Carnegie Hall, Jordan Hall, the National Arts Centre, Roy Thompson Hall, Segerstrom Hall, and the Chan Centre. Rachel Kristenson is Concertmaster of the Okanagan Symphony Orchestra in Kelowna and often sits Principal Second Violin with the MCO. Mrs. Kristenson graduated from the prestigious Cleveland Institute of Music with Bachelors and Masters degrees in Violin performance, and has performed with the Calgary Philharmonic Orchestra, Winnipeg Symphony Orchestra, Symphony New Brunswick, Symphony Nova Scotia, Fairbanks (Alaska) Symphony, and others. The concert begins at 7.30pm (doors open at 6.30pm) on March 19th in Westminster United Church, 745 Westminster at Maryland. (Click here for matinee concert details.) Tickets, at $35 for adults, $33 for seniors and $15 for students and those under-30 (incl. GST), are available at McNally Robinson, Organic Planet (877 Westminster Ave), and on MCO’s Ticketline at 204-783-7377. As you may know, over the past couple of seasons the Manitoba Chamber Orchestra has been commissioning some of the most promising, adventurous, and beloved composers working today to write brand new works for orchestra. We’re calling this the New Concerto Project. It’s already included several exciting events, such as the premiere of David Raphael Scott’s Ritornello, Heidi Ouellette’s Turtles all the Way Down, and Philip Glass’ third piano concerto. And there’s so much more the New Concerto Project has in store for audiences over the next few seasons. Some of the other pieces we’re premiering will be irresistible audience pleasers. Others may be more challenging, but always with the goal of pushing forward the tradition, expanding the Canadian repertoire, and empowering a diverse group of artists to share their gifts and stories. This season includes two new concerto premieres, both of which are presented at our March 19th matinee and evening concerts. In programs that also include works by Haydn and Mozart and blistering solos from many members of our orchestra, we premiere a double violin concerto by the brilliant JUNO Award-winner Vivian Fung, whose music is celebrated for integrating non-Western folk music, Tibetan chant, and Brazilian rhythms. At that concert, we also premiere a new work by Kevin Lau, a prolific composer of orchestral, chamber, ballet, and film music, who studied with composer Christos Hatzis, a long-time MCO collaborator. The MCO encourages you to check out both Lau’s and Fung’s interesting notes about their pieces (Lau’s note appears below, and Fung’s will be included in the March Chamber Chatter insert). We also urge you to order tickets to one of these two tour de force concerts, which shine a spotlight on the brilliant musicians and composers who work with the MCO. JUNO Award-winning composer Vivian Fung has a unique talent for combining idiosyncratic textures and styles into large-scale works, reflecting her multicultural background. Her work often integrates disparate influences such as non-Western folk music, Brazilian rhythms, and visual inspirations. Fung’s recently composed works include Clarinet Quintet: Frenetic Memories, premiered by the Daedalus Quartet and clarinetist Romie de Guise-Langlois; Humanoid for solo cello and electronics for a consortium of cellists in Canada and the U.S.; Earworms for the National Arts Centre Orchestra; and a new solo percussion work The Ice Is Talking (for three ice blocks) commissioned by Banff Centre. Her 2018/19 highlights include commissions from the Winnipeg New Music Festival, and a new string quartet for the American String Quartet commissioned by the Red Bank Music Society. Born in Edmonton, Fung currently lives in California and is on the faculty of Santa Clara University. For more information, please visit vivianfung.net. Described as a “self-assured voice” (Barczablog) with a “masterful control over his idiom” (Classical Music Sentinel), Kevin Lau has established himself as one of Canada’s leading young composers. Awarded the 2017 Victor Martyn Lynch-Staunton Award by the Canada Council for the Arts for outstanding achievement, Kevin’s music has been commissioned and performed by a diverse array of ensembles across North America. They include the symphony orchestras of Toronto, Vancouver, Saskatoon, Vancouver, Niagara, and Indianapolis as well as the National Arts Centre Orchestra, Hamilton Philharmonic Orchestra, Hannaford Street Silver Band, National Brass Project, New Brunswick Youth Orchestra, Against the Grain Theatre, Ensemble Made in Canada, Trio D’Argento, TorQ, the Cecilia and Afiara String Quartets, and the Houston-based River Oaks Chamber Orchestra. He recently composed the score for the National Ballet of Canada’s original full-length ballet Le Petit Prince (which premiered in 2016), featuring choreography by NBOC Principal Dancer and Choreographic Associate Guillaume Côté. His second ballet score, Dark Angels, was commissioned by the National Arts Centre Orchestra for its Encount3rs project in 2017, and was described as “riveting” (Ottawa Citizen), “dark and affecting” (Globe and Mail), and “extraordinarily accomplished” (Artsfile). In addition to composing concert music, Kevin is active as a pianist and film composer. He has written scores for over a dozen films, including for Charles Officer’s feature documentary Invisible Essence: Le Petit Prince (2018). He recently performed one of his own commissions (The Nightingale) with members of the River Oaks Chamber Orchestra in Houston, Texas. Born in Hong Kong, Kevin moved to Toronto at seven. In 2012, he received his doctorate in music composition from the University of Toronto under the supervision of Christos Hatzis, and has guest-lectured at the University of Toronto for the past four years. He served as Composer-in-Residence for the Mississauga Symphony Orchestra (2010-12), Banff Centre (2012), and was artistic director of the Sneak Peek Orchestra (with conductor and co-founder Victor Cheng) until 2014. He served as the RBC Affiliate Composer for the Toronto Symphony Orchestra from 2012 to 2015. Vivian Fung’s Concerto for Two Violins and String Orchestra continues Fung’s deep interest in writing for strings, which has yielded two previous violin concertos and four string quartets, the most recent of which is to be premiered in May 2019. The double concerto concentrates its attention on the interaction between the two solo violinists as well as with the orchestra. Very often the two violins play off each other and form interlocking patterns, so that the two composite patterns form a unified whole. This idea of interlocking patterns is a concept that Fung absorbed when she was part of a Balinese gamelan, and that concept resonated with her when composing the concerto. The work starts ruminatively, with Baroque-like suspensions between the violins, but steadily builds into fast-paced virtuosic music that dances and moves at a fast clip. Throughout, the two violins trade material with other, and interlocking rhythms form a big part of the material. A neo-Baroque-like melodic line provides some contrast to the rhythmic activity and at the crux of the piece builds into a cathartic chorale and climax. Material from the melodic line is then transformed into a final chaconne and builds into a tragic full apotheosis. The piece ends with all strings sliding upward, and the music ends softly as it began, disappearing into the ether. This dramatic and vividly theatrical work dates from a period when Haydn’s style was undergoing change. This reflected a widespread artistic trend of the period, which took its name, Sturm und Drang (Storm and Stress), from a popular German play. Inspired by a strengthened sense of individual expression, it nurtured the presentation of deeper, darker emotions, as a supplement to the courtly gentility characteristic of previous years’ art. Haydn entered the service of the Esterházys, an exceptionally wealthy Hungarian family, in 1761. Although their court orchestra was small—no more than 18 players during this period—its excellent quality proved a powerful stimulus for Haydn’s imagination. It also won his deep admiration and loyalty, nowhere more clearly and cleverly demonstrated than in this symphony. Prince Nicolaus Esterházy owned a palace in Vienna and two grand estates, one at Eisenstadt, the other a summer residence at Esterháza. The Prince adored his summer retreat. It became his habit to spend more and more time there. In 1772, he stayed longer than ever, into November. This distressed the members of his orchestra, who had not been allowed to bring their families with them from Eisenstadt. They turned to Haydn for help. He composed this symphony in such a way as to give the Prince a gentle hint that it was time to leave. It is one of Haydn’s few symphonies (11 out of 104, to be exact) in a minor key. It also appears to be the first-ever symphony in F-sharp Minor. There have been only a few later examples, such as Alexander Glazunov’s Second. There are no preliminary gestures. Haydn flings us directly into a turbulent, dramatic world. There is only minimal respite in the opening movement, which is filled with many sudden shifts in dynamics and nervous string tremolos. Haydn follows it with a full‑scale adagio. Opening with a march‑like tread, it strikes a pathetic mood, full of wistfulness and yearning. Could he have intended it is a portrait of his unhappy orchestra? Unusually, the following minuet begins quietly, almost hesitantly, a quick indoctrination into its nature, which is far removed from the dance floor. The central trio section includes a quote from an ancient Gregorian chant melody, the original text drawn from the lamentations of the prophet Jeremiah. The finale returns to the minor‑key activity and storms of the first movement. But then Haydn calls an abrupt halt, switching to a serene, restful adagio in a major key. He gradually peels the orchestra away, singly or in pairs. At the first performance, the musicians (most of whom played standing up) snuffed out the candles on their music stands as they departed. Finally, just two violinists remained to complete the pantomime: Haydn and concertmaster Luigi Tomasini. Prince Nicolaus took the hint and gave orders to pack up and leave for Eisenstadt the next day. This episode did not anger the music-loving nobleman. In fact it served to endear Haydn to him more than ever. Writ in Water derives its title from the epitaph on poet John Keats’ gravestone, which reads, “Here Lies One whose Name was writ in Water.” These words, written by Keats himself, suggest impermanence: the ephemeral nature of an artist’s legacy, perhaps, or of life in general. The sentiment behind the epitaph is more complex. To me, these words express despair, defiance, resignation, and a strange kind of affirmation all at once. Writ in Water’s music embodies these conflicting states of mind. Moments of tranquil lyricism collide with moments of anxiety and pain. Certain phrases appear once, only to fade, unresolved, like words written in water. Much of the music passes in a dream-like manner, attempting (and often failing) to find firm ground. At its core, Writ in Water represents my attempt at grappling with the themes of life, death, and memory associated with Keats’ epitaph. The Kübler-Ross model of grief—comprised of stages of denial, anger, bargaining, depression, and acceptance—provided me with an initial psychological and structural guide, although in my work these stages unfold in a manner that is by no means linear. Each is characterized by a particular fragment of musical history. I wanted this piece to feel like a journey into the past, as a metaphor for the way we engage, productively or otherwise, with our own past while grieving. The work’s end pays homage to the final bars of Haydn’s ‘Farewell’ Symphony—in which instruments are extinguished one by one, like candles. In 1769, Mozart was awarded the post of Honorary Concertmaster in the Salzburg Court Orchestra. His duties included leading from the first desk of violins (this being before the rise of the conductor, as we know the role), playing solos, and writing music for the orchestra to perform. Three years would pass before he began receiving a salary for these considerable responsibilities. Between 1770 and 1773, he composed no fewer than 28 symphonies. This huge output sprang from his ever-practical responses to the demands of the time. One early cause was the death in December 1771 of the Prince-Archbishop of Salzburg, Mozart’s employer, with whom he enjoyed a fairly cordial relationship. Mozart’s association with his employer would deteriorate catastrophically under the Prince-Archbishop’s successor, the strict and unappreciative Hieronymous Colleredo. Colleredo’s outlook meant that theatrical entertainments were banned during the official period of mourning for his predecessor. The public’s thirst for music had to be satisfied through instrumental concerts, and Mozart was only too happy to supply material. Once the needs that had inspired this outpouring of symphonies ran their course, his output slackened, never again to reach such concentrated heights. His symphonies of this period are uniformly pleasant, festive works, perfectly fulfilling their sole ambition: to entertain. In contrast, his next symphony is quite a startling work, one foreshadowed in his catalogue only by the minor key overture to his oratorio La Betulia liberata (Betulia Liberated, 1771). Symphony No. 25 in G Minor, K. 183, which Mozart completed on 5 October 1773, is his first full-scale piece in a minor key, and his first exercise in symphonic drama. Its stark, pulsating opening movement provided an appropriate soundtrack for the harrowing title sequence in the film Amadeus. Switching moods once again, the next symphony, K. 201 in A Major (known as No. 29 and completed in April 1774), is one of his sunniest, most optimistic orchestral pieces. The light, transparent orchestration adds further appeal. Mozart scholar Neal Zaslaw writes of it, “Much of what I have stated about K. 183 could be repeated about this work, including the use of sonata form in three of the four movements; the strongly contrasted character of the andante (in this case perhaps noble serenity rather than longing); the symphonic rather than the dance quality of the minuet; and the basing of the opening of the finale on a transformation of the opening of the first movement.